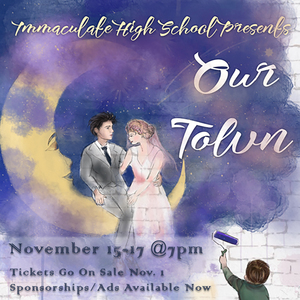 Immaculate High School students will perform Thornton Wilder’s American classic Our Town on November 15, 16 and 17 and the public is invited to see this beloved show. The showtimes for Our Town are November 15, 16 and 17 at 7pm at the Immaculate High School Theater. Tickets are now on sale at https://ihsfinearts.booktix.com/, as are sponsorship opportunities and program advertising. General admission tickets are $15 for adults, $10 for seniors and $5 for students.